Hiroshi Ito Spirited Away Bath House « Adafruit Industries – Makers, hackers, artists, designers and engineers! Now you can explore one of Hayao Miyazaki’s iconic set pieces as an incredibly detailed model, thanks to self-taught Japanese sculptor Hiroshi Ito. 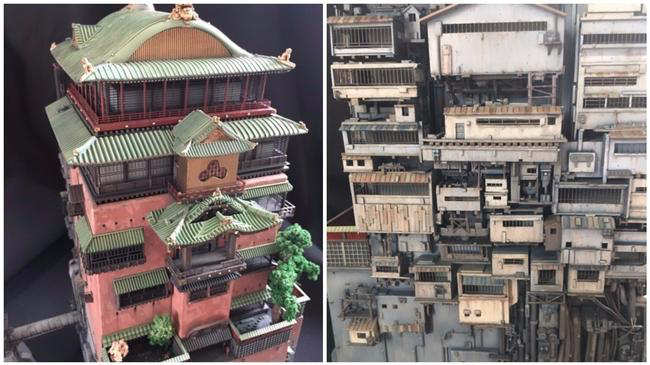 The model depicts Yubaba’s bath house, the centerpiece of Studio Ghibli’s Academy Award-winning Spirited Away. The self-taught, Yokosuka-based artist made a wondrous recreation of the structure—entirely by hand—to show his love of the film. “Most importantly, I am a fan of Hayao Miyazaki’s movies,” he tells Creators. The 42-year-old, who goes by Sorakio on Twitter, made the stunning 3D rendition with putty, plaster, and parts salvaged from model warships. The incredible detail comes from his own etchings, as well as these repurposed parts, which together make up 90% of the models. He then hand-paints each sculpture to bring it to life. He tells us this work unfortunately isn’t for sale, but occasionally goes on display at anime fan exhibitions. He is currently working on another ode to Studio Ghibli, the antique shop from the Miyazaki-written Whisper of the Heart. Read more and see more from Hiroshi Ito.